Gather a bunch of skydivers and non-skydivers and it would be easy to start a debate and maybe an argument about skydiving while pregnant. The “safety first” group will quickly point to a number of what-if scenarios as to why woman should stop skydiving when they become pregnant. The truth is there is little research into the true risks and effects of skydiving during gestation. If you don’t have your skydiving license but want to skydive, you are probably out of luck. Most, if not all, dropzones won’t allow students with any medical condition to jump. This include pregnancy, back injuries, or other condition that could become a safety issue. This is simply to reduce the risk and liability. 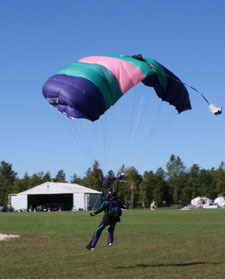 This includes tandem skydives, IAD and Accelerated Freefall (AFF) training programs. If you really want to jump, you need to find out where to go skydiving. You’ll need to call and make a reservation. When you call, ask the drop zone about skydiving while pregnant but don’t be surprised if they don’t allow you to make a jump. If you are in Orlando, Perris CA, or many other cities with a vertical wind tunnel, you might try indoor skydiving. Most doctors will try to stop pregnant skydivers from continuing to skydive after the become pregnant. The general consensus from skydiving moms is that if you are an experienced skydiving with consistent landings then it’s probably okay to continue to skydive for about the fist six months of pregnancy. If you’ve not skydived before or aren’t particularly good at skydiving, it’s best to not start skydiving and maybe suspend skydiving until after the baby is born. Starting an AFF program while pregnant isn’t advised. It’s also not a good idea to down size your canopy or jump unfamiliar gear. You should also not start learning a new skill such as free flying. If you’re going to jump, stick to what you know and enjoy doing. The decision to skydive or not during pregnancy is a personal one. Most people on either side of the debate agree that after about the sixth month and during the third trimester, it’s best to stop skydiving. The risks of skydiving while pregnant carry all of the risks of skydiving while not pregnant with the addition of risks to the unborn baby. There’s rumors that the altitude effecting the fetus have proven false. As has the fear that the stress of skydiving will harm the fetus. Normal skydiving risks such as hard openings, in air collisions, and hard landings could have a more dire outcome. From a medical standpoint, some hormones soften joints during pregnancy to help with the birthing process. It’s possible that these physical changes could open the jumper up to greater risk of injuries and sprains. If you have a high risk pregnancy or complications with your pregnancy, you may want to give more thought to skydiving and the risks. If you continue to skydive while pregnant, you should speak with your doctor. They will in all likelihood encourage you to stop but that decision is yours. During pregnancy a woman’s body uses carbohydrates more quickly. Exercise also increases the metabolism of carbohydrates. These two factors can lead to low blood sugar reactions during exercise. If you do skydive, be sure to keep hydrated and eat plenty. If you are pregnant and want to skydive, it’s up to you to evaluate the risks and decide if the reward of skydiving is worth it to you. There will always be people to who will second guess your decision, not matter what you choose. There are countless women who have skydived while pregnant. Most pregnant skydivers, count the number of in utero jumps their babies have. Some babies have hundreds of jumps before they are born. There’s not indication if this makes the child more likely to skydive when they get old enough. One of the biggest concerns is you blame yourself if you continued to skydive and something happened. If you have any doubt about being able to handle any possible consequences from skydiving accident, you should consider carefully if you should the suspend jumping while pregnant.